These pre-stamped letter-sized envelopes were a great find on eBay - I paid about face value, including shipping. Boo-yeah! I love the kittyface. Their only drawback is that they reek, positively REEK, of cigarette smoke, but hopefully by the time they reach their destination, they won't smell quite so bad. The cat face rocks. I kind of enjoy the serendipity that this envelope was photographed very near some cat-claw marks on my own beloved table... I left those in instead of cropping 'em out. They're in the upper right-hand corner of the photo. 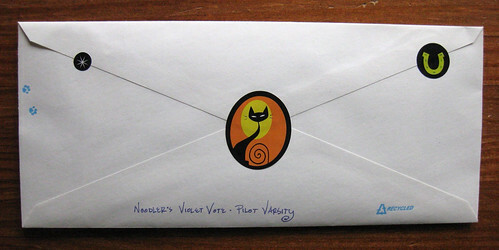 And by the way, what IS it with letter-writing and cats? An awful lot of my correspondents are also cat owners/lovers. 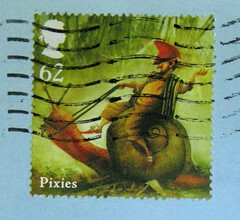 I sealed this envelope with a charming sticker by Red Tango. I don't know what it is about cats but I sure do love them. 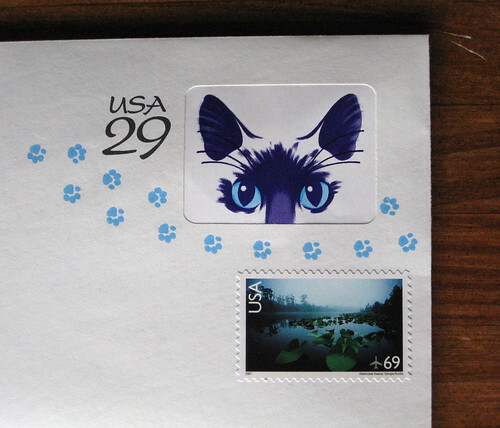 That is the cutest stamp I have ever seen. I just found your blog~~I too, love to write letters and all things that have to do with letter writing. I found a hand written invitation to a 50th anniversary party dated 1959 in a box of old stationary I bought at a thrift store! No smokey smell when I received mine!